Featuring fast and fun waterslides and a diving board, the outdoor thermal park is perfect for adrenaline enthusiasts. There is also plenty of room for people wanting to practise their stroke, while the tall trees offer a cool escape from the hot sun. The renovated indoor thermal park is bright and fresh. The lower floor is intended for lively, active fun and is sure to be popular with families, while the upstairs is aimed at rest and relaxation, featuring saunas and rest areas. Take a look at our affordable packages! The outdoor area of the park is all about summer fun! Our entertainment coordinators make sure there’s always something going on at the pools. Discover the waterslides for adrenaline enthusiasts and families, including the Boom waterslide with visual and sound effects. When you are ready for some rest, relax in the shade of the tall Prekmurje trees. Did you know that a race car driver accelerates at 1.6 G? Well, the acceleration force on the Aqualoop waterslide is 2.5 G! Experience the rocket-like start of the world’s first waterslide with a 360° loop – at 80 km/h, it is also the fourth fastest waterslide in Europe! There are waterslides for the brave and then there are waterslides for the bravest. Our Kamikaze waterslide definitely belongs in the latter category! Slide into the pool from a height of 22 m while barely even touching the waterslide below you. The feeling of freefall will make you feel as though you’re flying! Climb up above the thermal park and fly over the pools! 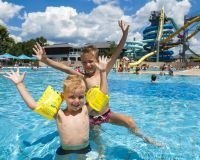 The zip line extends from the Aqualoop waterslide to a soft landing on the other end of the outdoor thermal park. Experience this adrenaline-filled flight to discover the Prekmurje landscape as the storks see it. 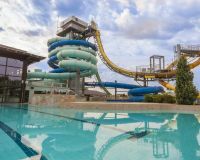 !The water slides Aqualoop and Kamikaza, the outdoor waterslides, the multi-purpose swimming pool and swimming pool with diving board, are open from 27th April until 15th September.